Product description: MPPT solar controller can track the MPP point fast and accurately in any situation which will improve energy efficiency and obtain the maximum solar energy. It can fast and accurately MPP of photovoltaic array in any situation and obtain the maximum solar energy at any time, which remarkably improves energy efficiency. It can fast and accurately MPP of photovoltaic array in any situation and obtain the maximum solar energy at any time, which remarkably improves energy efficiency. With Modbus communication protocol interface, it is convenient for user to expand applications and meet monitoring requirements in various fields like telecommunication base station, household system, lighting system etc. Tracer-BN Series is a flagship member among all tracer MPPT controllers. We design with very long lifespan industrial materials and die-cast aluminum housing cooling system, to improve the controller's performance and life. eTracer is an intelligent, efficient, high-speed solar charge controller with advanced Maximum Power Point Tracking (MPPT) algorithm, which can harvest the maximum power from the solar array to charge battery. 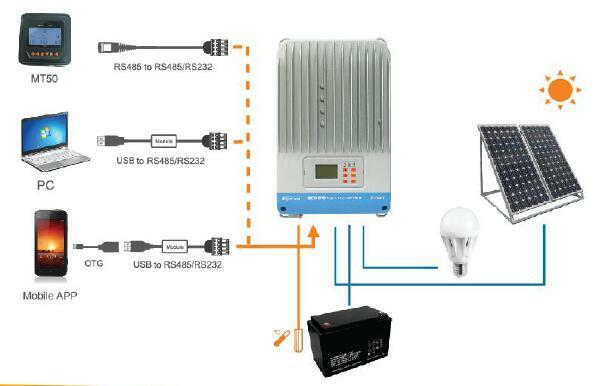 It can be applied in the off-grid PV systems up to 3KW, and increase the efficiency up to 30% . iTracer is an intelligent, efficient, high-speed solar charge controller with advanced Maximum Power Point Tracking (MPPT) algorithm, which can harvest the maximum power from the solar array to charge battery. It can be applied in the off-grid PV systems up to 3KW, and increase the efficiency up to 30% . VS-A series is common positive controller with LCD display, adopting the most advanced digital technique, high cost performance. It has communication function via RS485 port to PC monitoring software, realizing real-time monitoring and battery management parameter setting. LS-E series is reliable, stable, and economical solar charge controller, easy for operation. LS-EU series is reliable, stable, and economical solar charge controller, easy for operation. USB output can charge mobile phone, DC fans, and other DC electronic device. Landstar B series controller with high reliability, accuracy of sampling and full electronic protection. Programmable via remote meter MT50 ,PC software and APP. All the terminals backwards. Ideal for surfacing mounting solar system, such as solar home system, portable solar system. LS-EPD series solar charge controller is an affordable waterproof charge controller with automatic lighting control function, ideal for extreme environments with corrosion, dust, moisture etc. LS-EPLI series combines solar charge controller and LED driver into one unit. It is ideal for solar LED Lighting requireing dimmer function. The control parameter can be programmed by Mobile APP and SPP-02 via infrared(IR) communication. EP series is economic controller for solar home system and other small solar systems. All the electronic components are industrial grade without any mechanical switch. The electronic protections ensure the reliability of system. EPIPDB-COM is dual battery charge controller for caravans, RVs, boats and golf cart etc. Two batteries charging eliminate the extra cost of two separate solar charging systems. CLICK HERE TO DOWNLOAD FULL CATALOGUE FOR SINOLTECH SOLAR CONTROLLER PRODUCTS. SINOLTECH firstly starts cooperation with EPSOLAR in year 2009, taking charge of the overseas marketing in Europe, North America and Southeast Asia.Covering a wide range of products include solar charge controllers, off-grid inverter, LED driver and special power units etc.All the solar charger controller products have passed CGC-SOLAR ,CE ,ROSH, FCC and ETL certificate, as well as other domestic and international authoritative certification and a number of patents.The products have been extensively applied and highly appraised in a number of major projects at home and abroad.In 2016, SINOLTECH's supply ability for solar charger controller is 850K pcs, with an annual sales turnover USD 10 Million.